Posted August 8, 2014 by Kurt Henninger . Let’s face it, Adwords is a fantastic and quick way to reach potential customers. It has grown especially important for small business owners who are seeing previous methods of bringing in new customers dry up in terms of productivity. Older marketing mediums such as newspapers and yellow page ads are becoming harder to pull new customers from as their readership goes down. On the flip side there is Adwords which is marketed as a quick and easy way to get your message in front of new potential customers. On the surface, Google WANTS people to think that Adwords is simple to manage, promoting new products such as Adwords Express specifically designed to eliminate alot of the details and clutter in managing a Pay Per Click campaign. However, as with any digital marketing platform, the devil is truly in the details and to really get any performance out of Adwords, you need to manage the fine details of it. While it can be quick to implement, taking hours and days rather than weeks and months those fine details are absolutely crucial to master to get the most performance out of your advertising spend. To that end, here are some of the common errors that we find when we review accounts from small business owners. This is by far the most common error and can cause the most problems later on as you try to improve the performance of your campaigns. However, first we need to understand and discuss the idea of what conversion tracking is. The purpose behind why most small businesses use Adwords is to drive additional customers to their store through either making a phone call or filling out a form on the business owners site requesting additional information. To illustrate this, let’s take the example of someone coming to your website and filling out a web form. The scenario generally follows something like this. First the potential customer clicks on an Ad on Google which directs that person to a specific page on your site. Next, the visitor is interested in what you have to offer on your site and fills out the form requesting additional information. Finally they are done and are directed to another page known as a “Thank You Page” thanking them for filling out that form and saying your company will get back to them soon. This is where “conversion tracking” comes into play. “Conversion Tracking” is a snippet of code that you need to put on your website which tells us when someone actually filled out the form or not. It will communicate that information back to Adwords and record which keyword and ad were responsible for that conversion. One of the basic methodologies that helps you get the most performance out of Adwords is to track what keywords are converting to calls and leads and which ones are not. Without conversion tracking, you don’t know what keywords are working well or which ones are performing poorly. From there you are able to trim out the proverbial fat in your account and get to a point of profitability in your advertising. 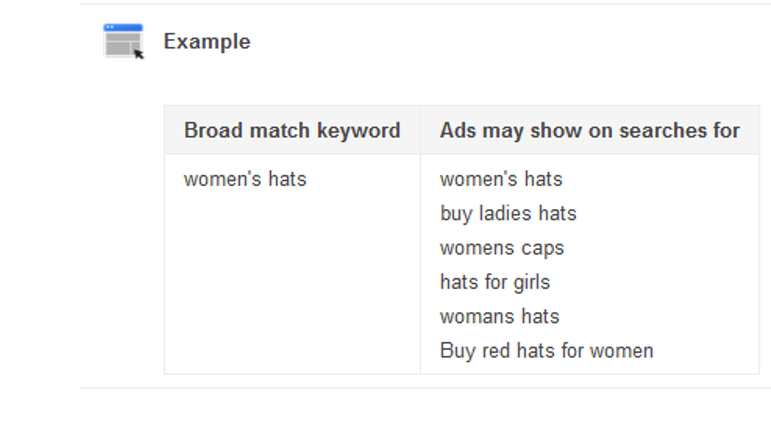 #2) Using the default settings for which “Networks” you are using in Adwords. Did you know that when you advertise with Adwords, you can potentially be advertising on three distinct ad networks? Each has their own unique audience and volume of visitors and strategies to make the most out of it. The networks that you can advertise on with Adwords: Google Search, Google Search Partners, and the Display Network. Let’s go into a quick explanation of each. Google Display Network – You know alot of the ads you see on the sidebar of sites like NYTimes.com, About.com or even ESPN.com? Alot of those are part of what is known as the Google Display Network and have an absolutely huge reach all over the internet. By Google’s own estimate between the 3 networks, they cover over 80% of all web visitors on the internet. 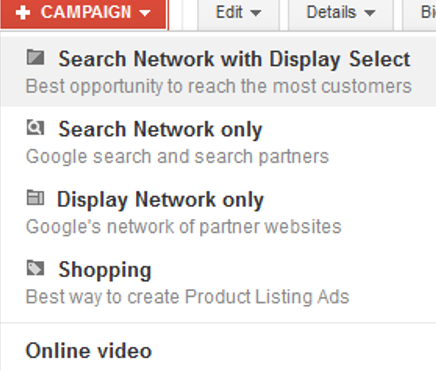 The default settings when you set-up a brand new campaign are to use BOTH the Google Search Network and Display Select. This is a hybrid approach combining both Google Search and Search Partners, and part of the Display Network as well. 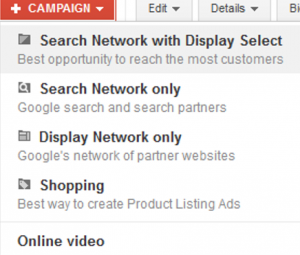 As you can see from the image above, Google recommends “Search Network with Display Select” as the best opportunity to reach the most customers. In my opinion there are several things wrong with this model and we recommend at least STARTING only with the Google Search network. This recommendation is made for several reasons, but this is the most conservative approach to starting with Pay Per Click advertising where you will have the highest chance for success from the get-go. Once you’ve had success there you can scale your PPC campaigns up and test other networks out to see if they work for you and whatever metrics or KPIs you are trying to meet. Here is what a “correct” setting looks like, at least to start off an account. Alot of times when we delve into campaigns we take over, one of the first problems we see is listed under the status column, “Limited by budget”, such as in the image below. At first glance you might think that this is a good thing, but from a performance perspective it can really hurt. The reason being is that when you see that warning, this means that you are routinely running out of budget or ad spend before the end of the day. This means that your ads stop showing at some point throughout the day. In turn, some potential customers who are searching for what you have to offer later in the day will NOT see your ads and not get to your website! 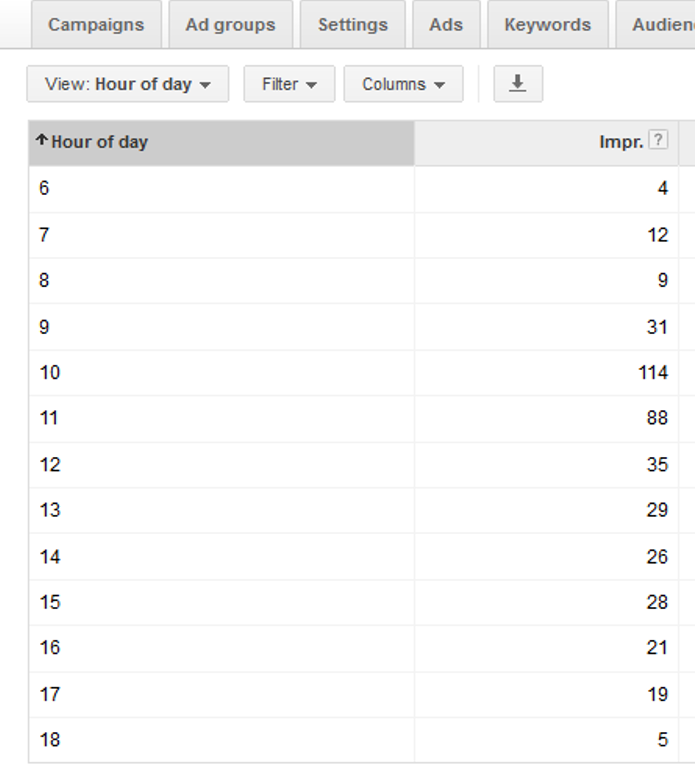 Here is an image illustrating this point, showing the number of ad impressions, by hour, over a given day. This particular account doesn’t even start serving ads until 6AM, but during this time period, all of their adspend was used up by 6PM! You are limiting yourself from having potential customers find you if your Adwords account is running like this. #1) Raise your daily budget limits if you have any flexibility with your budget. 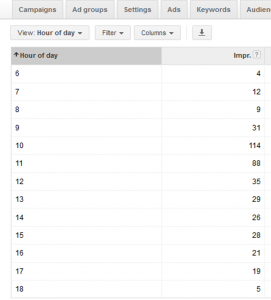 #2) Lower your keyword bids so that you won’t burn through your adspend so quickly throughout the day. A negative keyword is a keyword you use so that your ads DO NOT show when someone includes that phrase or word in what they type into a search engine. For example, let’s say that you are run a plumbing business in Denver Colorado. A typical keyword for this may be “Denver Plumber” (In this case, without the quotes). You can see how adding negative keywords “commercial” and “weekend” would preclude your ads from showing for these unwanted searches and save you money to advertise to potential customers looking for exactly what you have to offer. There are 5 basic types of keywords you can use: Broad, Modified Broad, Phrase, Exact and Negative. 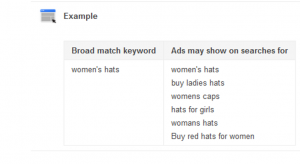 Without getting into the nuances of each match type here is a reference article to read about this a little bit further Adwords Keyword Match types. You get the idea here. Using broad match keywords is NOT a beginner strategy and should be reserved only for those who really really know what they are doing in Adwords. OK, so do your own Adwords campaigns suffer from these common problems? Let us know in the comments below! Another great post Kurt! I did not know about Display Select. Personally, we use Google Search only. The Display Network got us clicks but no conversions. The Search Partners did get us conversions, but the ROI wasn’t there so we dropped that as well. We get the most conversion when our ad is in the top paid spot across the top of the left hand column. Same spot on the right is like a consolation prize. So we see to it that we are always at the top. The strategy is pretty simple. Outbid everybody else and control your spend by constantly adjusting your geo-target radius. You can really adjust by anything, towns, zip, etc. but you already knew that. Just said it for the sake of the post. By using this method, we maintain an average position of 1.1 with a 94% impression share. We’ve also learned that PPC customers are better customers and spend more money. Our system works so well, sometimes we have to pause all campaigns because we’re so overwhelmed with work we’re making customers angry. It’s that way right now. We’ve had AdWords turn off for over 2 weeks and we are jammed. Hard to believe, but it’s true. If things don’t change, I’m going to pause Bing/Yahoo as well. Thanks for your comments there. It sounds like you have a pretty good handle on your account. 94% impression share is pretty darn impressive. One of my main points here is just to take control of your account and not just “let things be” and let the machine control it for you without making that a conscious decision. That is a good place to be in to have to pause a campaign because you are generating too much business from it. Sounds like it may be time to grow your shop!